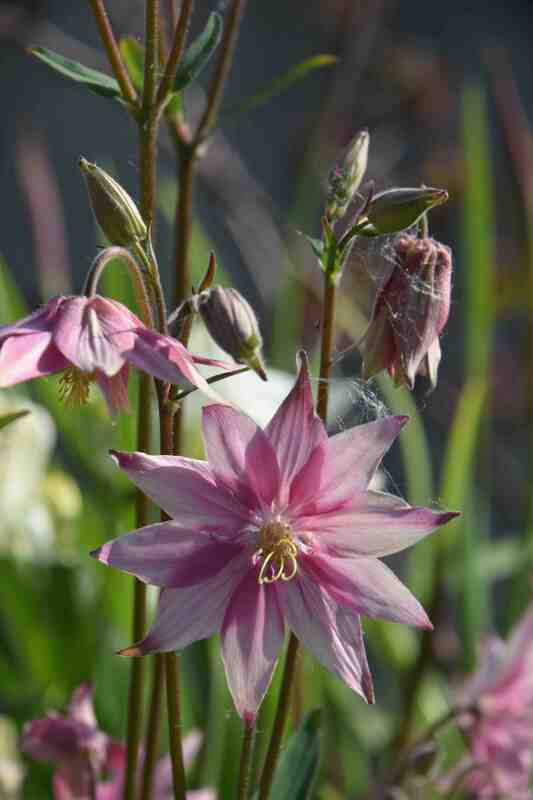 It is aquilegia time and anyone who has grown them, or is enjoying them right now, knows that they combine showy colour and delicacy of form with more pananche than almost any other hardy plant. Aquilegias are found in the wild around the Northern Hemisphere and those in the Old World are pollinated by bees and have short spurs and those from the New World are usually pollinated by humming birds and red and yellow colours are predominant and the spurs can be up to 18cm long in A. longissima. When you grow hybrids that involve the New World species here in Europe, where there are no humming birds, the bumble bees soon learn how to get at that nectar, too deeply hidden for their stubby tongues, and they chew their way through the petal tissue to get a meal without actually pollinating the flowers. The European and Asian species with short spurs should be pollinated and plundered for nectar in the normal way but it seems that once a bee gets into a habit it just can’t stop itself from robbing and when there is a wide range of hybrids, even the ones that should be treated properly get mugged. You can ignore the next three paras if you want to skip to the relevant stuff! Aquilegias are in the ranunculus family (Ranunculaceae), a group of plants that is ridiculously diverse. I get a bit frustrated when names change and the splitting of the old Liliaceae into what seems like myriad new families really confuses me. I just wonder why botanists have not turned their attention to splitting up the Ranunculaceae, though at the moment I am glad they haven’t, because if ever a family had some ridiculous members, this is it. I can’t even find one definitive characteristic that defines them – there are always exceptions. One feature that seemed to be more or less constant is that the flowers have showy sepals and the real petals are much reduced in size. A clematis has four or more showy sepals and there are no petals. Even in the Atragene group, including C. alpina, which seems to have petals, these are staminodes. Sepals do all the shouting in hellebores too, and in delphiniums. But when I was looking at the flowers of a buttercup, Ranunculus, the type genus, what did I see but small green sepals and the ‘petals’ really are petals – and there are five of them, which is the usual number for the family! Most Ranunculaceae are herbaceous and not many are woody but then there are clematis. Ranunculaceae tend to have alternate leaves, but clematis are opposite, except in the seedling stage. The fruit is an achene with one seed, but not in hellebores or aquilegias, and in the genus actaea, which now includes the genus cimicifuga, the flowers have fugacious petals (or sepals) that drop as soon as the flower is open, and they have a fluffy look because of the stamens. And the old actaeas have bright fleshy berries while the old cimicifugas have dry seed pods. And then there are anemones which often have small seeds equipped with fluff that must have led to their name of wind flower. The family includes many more good garden plants such as nigella, aconitum, caltha, thalictrum and hepatica: 2300 species in all in 43 genera. 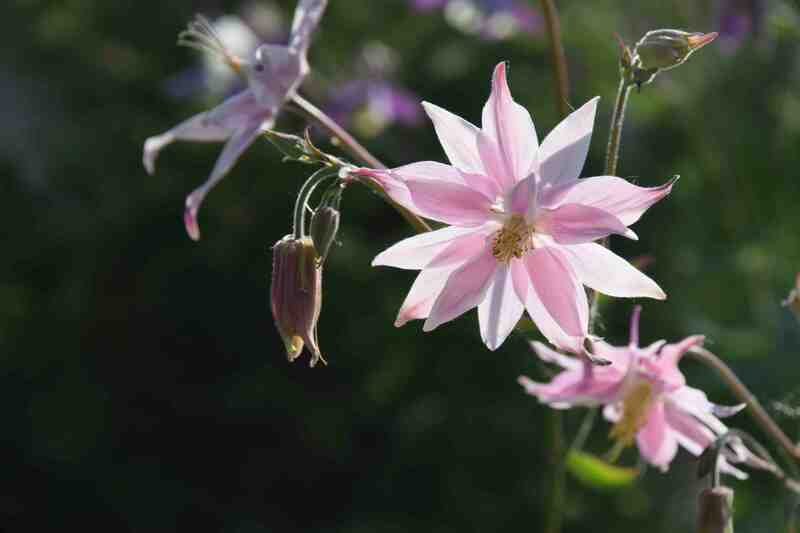 But back to aquilegias: this little beauty is a form of the very common and ever so pretty A. vulgaris. Called Aquilegia vulgaris var. clematiflora, A. vulgaris ‘Clematiflora’ or A. stellata or any combination of the previous words, it is very distinctive. While the traditional flower has five spurless sepals and five tubular petals with spurs (which in my imagination I can quite see have developed from nectaries, as seen in a hellebore bloom) this flower has no petals. Instead there are usually ten or more sepals which lie flat and create a starry bloom that is usually held facing downwards so the flowers look less like the traditional five doves and more like an umbrella or, since they are attached at the top, like one of those giant parasols, that always look as though they are going to fall over and engulf the unwary, you get outside cafes. The flower colour can vary through all the usual A. vulgaris spectrum, from white to pink and mauve, blue and purple. I like the fact that the flowers are pendent and do not stare you out when you wander past them. Lots of good things have happened to aquilegias in the hands of plant breeders, but bad things too: dwarf varieties are an abomination and the cheeky little blighters that have their flowers facing upwards are too forward by far and need to be erased from gardens. The irony is that if the poor little devils had not been made so short we would not have had to have them looking skywards – this plant in the photos for example is almost 1m high so I can see into the flowers without having to throw myself on the gravel. The simplicity of these flowers is joyful but there are other variations of this. The spectacular ‘Norah Barlow’ in red and white which has pompon flowers, is really just this that has been intensely doubled, and there are other colour forms which are all as interesting. 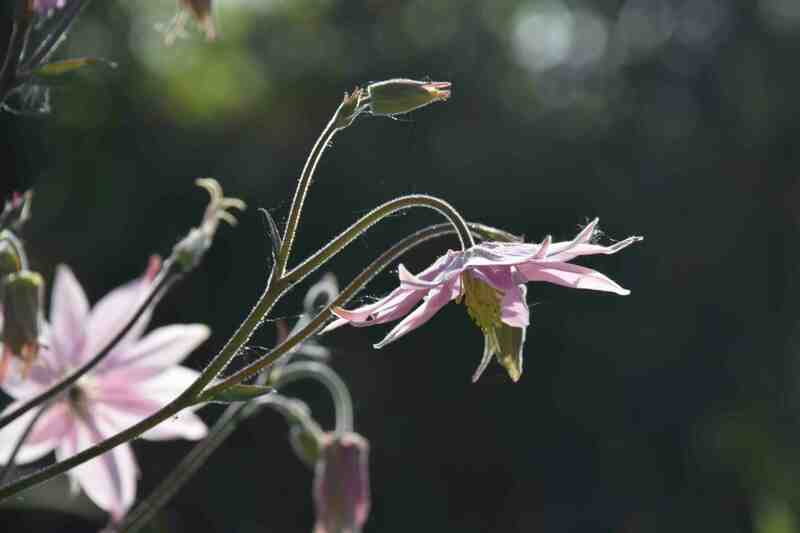 There are nasty hybrids called ‘Clementine’ which are nicely doubled clematis-flowered aquilegias in a good range of colours but they are dwarf and upward facing! A. vulgaris ‘Clematiflora’ breeds true if it is isolated from other aquilegias, but if not, a lot of the seedlings will have flowers that are part clematis-flowered with a few spurs thrown in and they have the beauty of Frankenstein’s monster. They look like the sort of thing Channel 5 would make a ‘caring’ documentary about and I cannot bear to look at them. Probably my favourites, if that is possible; so even more fascinating a post for me. I found the humming bird/bee distinction especially so. So that’s who’s been chomping ours. I have many wonderful variations including the one you photographed. All have arisen from an ordinary pink one and a dark blue one and a Nora Barlow ( which I seem to have lost now). I think they were over when you visited last year. Of course they have the irritating habit of seeding into your best little Spring perennials – erythroniums etc. Also the deer took a belated liking to them last year, previously never having touched them. But I note all the fellow Ranunculaceae they don’t eat – so perhaps chemicals is what they have in common! A couple of years ago, I decided to dig them all out. They can seed about and be quite a bit of work when they have finished flowering. But they survived my cull and this year I have the most fabulous display. Sometimes things are just meant to be! I agree, and young plants usually flower best so your cull of the old ones was a good move. I have found that it definitely pays to cut the old stems and leaves off after flowering – the plants send up fresh leaves and they tend to do better the next year too.